Those days whenever we pass by this quaint little place we will slow down and lookout for stray dogs and people crossing the haphazard street. The once rubber rich now palm oil dotted kampong town is just one main street only 2km long flanked by many 50ish's ramshackle wooden shoplots although we could see remnants of charred blackened debris where once stood some cottage industries. 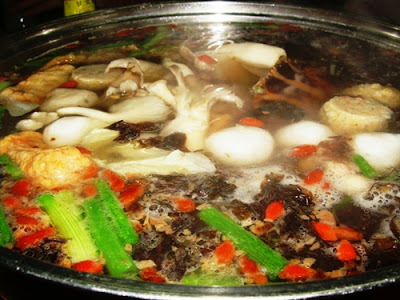 We were in the Glutton Zone Unforgettable of Fuzhou Specialities in Ayer Tawar, Perak the unassuming town of disproportionate alien talking rich men, eateries at every corner & unusual food. Ayer Tawar is just 12 km before its more illustrious Big Brother Sitiawan another 15 mins further up towards your final seaside destination. Most outsiders to Ayer Tawar are on transit save for the occassional fast talking salesmen. It does however has its own special charms and some unusual restaurants including a classy award winning cake house and cafe. And the famously amazing Chinese cemeteries some 6 km away. But for us we were tempted by the unusual dishes served in the numerous coffeeshops and Big Fries here. And oh , also amazing prices. The red signboard and Chinese banner announcing the oft misundersood buns some 3/4 way into the town. 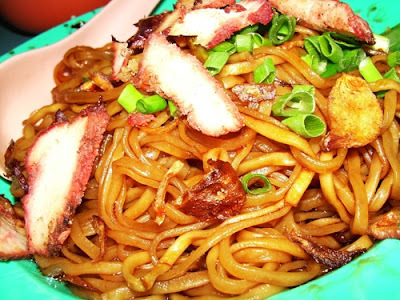 These signature oniony and porky items made famous in Sitiawan are also easily available here. Ok all your questions answered , for there are no less 10 BSG known versions of Kong Pian such as these. 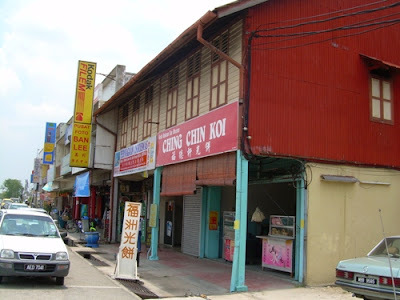 Then there are at least 3 more shops selling them here & 8 more in Sitiawan ! So take your time to admire them and see how they are made from the thouand year ( looks like it ) charcoal-fired old clay oven. The silkiest wantons you can find in this part of the small world. 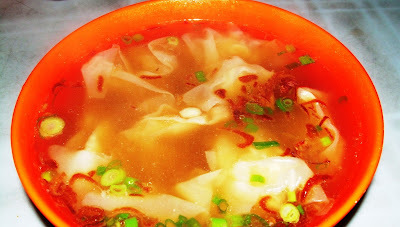 Called affectionately 'flat meat' pien neet soup it is different from the typical Cantonese ones in KL and goes with the vinegar garlic provided together with the Kg Koh chili sauce. 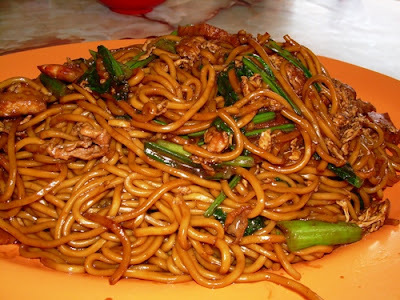 This is the no-frills fill-it-up dry noodles kam puang omnipresent in all noodle stalls here. Quick and rough it is supposed to do its job, and no more . Next hop over to the famous local folklore & eating institution, always featured in some national food magazine somewhere. Ancient and at least a 3rd generation 60 years old establishmant. This still stubbornly & proudly unchanged wooden shop is a specialist in all dishes Fuzhou and is still considered by the locals to be the numero uno, and a fav wedding feast caterer. 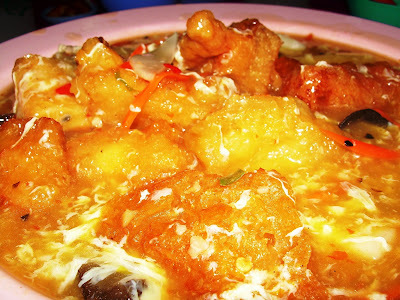 If you are short of time and not that adventurous you can try at one go the alltime Top 10 Fuzhou ( Hock Chew ) items right here ! Including their notorious ( yes ! marine friendly ) fake shark fins soup , which costs a fraction of da real thing ! Down the road is this great shop with the cheapest seafood steamboat we have ever encountered ! RM30 for 6 ! Piping hot and stylishly flavorful ( black small flying objects )...but no complaints ! ...still lingering as V write. 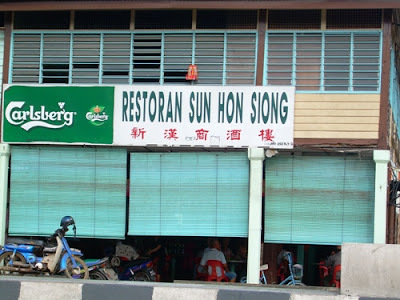 RM30 for 6 pax?! Kakakaka....mega unbelievable price. The fried Loo Mein and the kor roow look really inviting. 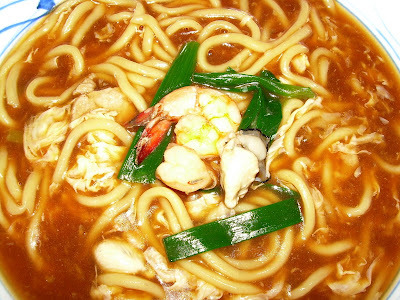 Yummm....how far is Ayer Tawar from KL again? Such a delicious write-up on a 2km town. *note to self: a must stop-by*. Err.. black flying objects = flies? 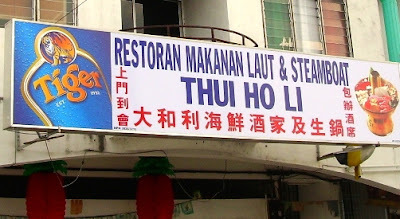 Ah... only been to Ayer Tawar twice but never stop and eat there. Thanx for the review! shud have told ya when u were nearby the other day ! 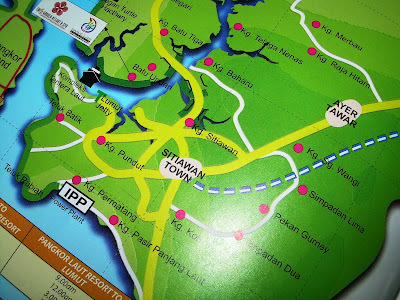 KL-Ayer Tawar under 3 hrs for you V guess, if u dun stop in Kampar (curry buns), Ipoh ( those chickens) or Bidor(da duck)! or overshoot to Pangkor if the red bikini ladies are there xcitingly complaining then you will probably take under 2 hours ! God knows how much V wanna do that! c o m i n g ! definitely u must. black things ? thats sad, but cheer up V gonna change that hope soon! u will need at least 24 + 25 hours ! now only 55 mins drive from where u are ! 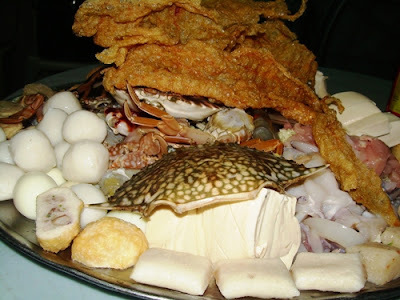 Oh, look at that plate of piled up seafood! WoW! 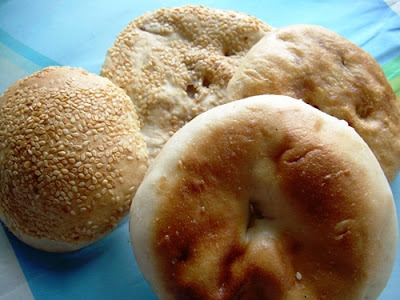 No choice...no Kong Pian for supper snacks :( ..is it the Pong Piah I usually call it? Hmmm....same thing different name ? it's mine too and i miss the food badly..
think u r talking bout the same thing ! thought Spore also got many of these things? V haven't tried many versions ourselves tho. maybe u could talk about them soon ! aiyo..next time when u go for a road trip....pls invite others bloggers along la... really envy the food crawl..
no not yet still waiting for you to uncover more ! ok Y E S ! Good thing i'm going back to S'wan next month. Your post is killing me especially the kuo ru! Gonna wack that kau-kau man!